Driverless cars will usher in a transport utopia, at least according to many of their proponents. 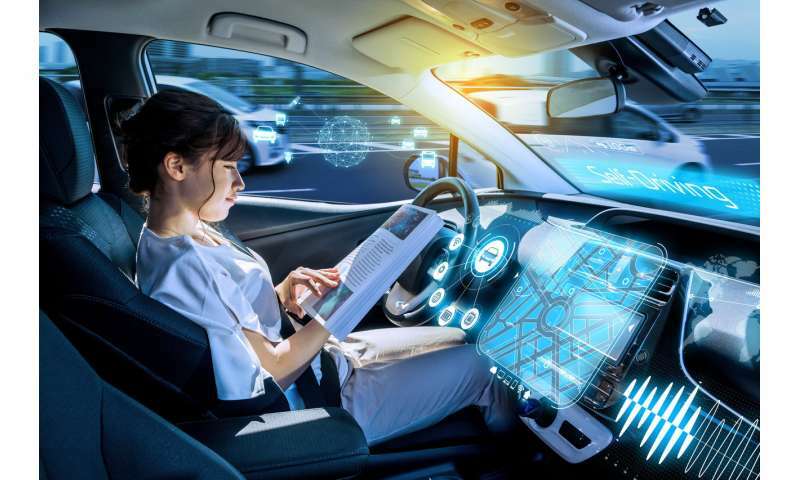 Concept art for these futuristic vehicles often show passengers sat facing each other, reading, working or enjoying some other activity as their car does the driving for them. I would argue that one of the main attractions of an automated vehicle is being able to do something else while you're safely and comfortably transported to your destination. But my Ph.D. research suggests we'll never be as comfortable or productive as these visions portray without finding a way to combat motion sickness. Just as passengers in human-driven cars can easily feel sick if they don't look out the window, giving up control to a self-driving vehicle to focus on something else will likely to lead to queasiness. In one recent experiment, my colleagues and I found that facing backwards in a driverless car increases motion sickness symptoms in 100% of passengers during normal urban driving. This echoes previous research that shows not being able to see out the front of a vehicle can worsen motion sickness. In another experiment, again echoing other research, we found that ability to perform a simple reading task was reduced by 40%, simply by being driven around at normal speeds on a normal urban route. However, we've also found that there might be technological ways to combat this problem. Motion sickness is caused by a conflict between the signals from our different senses. When our eyes observe the environment, our inner ears sense if we are moving. When the two signals do not match then we are more likely to develop motion sickness. For example, if you read a book in a car, your eyes see the stationary item but your ears tell your brain you are moving. The reverse is also true for so-called virtual reality sickness, where your eyes are immersed in a rich tapestry of information that tells you you are moving, but your inner ears can't detect any movement, leading to similar symptoms to motion sickness. Everyone except the profoundly deaf or those with true vestibular dysfunction is susceptible to motion sickness. The extent of the problem can depend on age, ethnicity, gender and past experiences. For example, Chinese people are generally more sensitive than white Europeans, females are more sensitive than males, and 11-year-olds are the most sensitive. Drivers, however, don't suffer motion sickness because they are aware of the likely future motion of the vehicle, like helmsman on boats. As a result, they tend to do things like tilt their heads against the turn of the car, which counteracts the forces of motion (whereas passengers tend to tilt with the bend). The main solution to motion sickness is to look at a fixed object in the direction you are travelling so that your eyes send the same signal to your brain about how you are moving as your inner ears do. This means it will be difficult for driverless cars to include rear-facing seats from where you can't see in the direction of travel. Other information that can tell us about the future movement of the vehicle can help minimise motion sickness. This can include voice cues from a satnav, directional lighting showing which way the car is going to turn, and virtual horizons that display where the real horizon would be. However, it may be possible to design driverless cars to reduce the chances of motion sickness in the first place. My colleagues and I have demonstrated technology that can reliably predict a passenger's motion sickness from their vital signs, posture and data from the vehicle for past and predicted future motion. Using this, we can create a personalised recovery programme depending on the individual and what they are doing. We can then adapt the car's control settings to minimise provocative motion further and maximise passenger comfort. We have also been researching how a small vibration device located just behind the ear can lengthen the time it takes the most sensitive people to start feeling motion sickness in a driverless cabin. Such a device could, for shorter journeys at least, enable you to avoid motion sickness without having to look out the window, and without the side-effects of medication. Future research will focus on how we can train people to gradually get used to riding and eventually multi-tasking in a driverless car so they experience less motion sickness. We also want to gather passengers' biometric data in more remote and discreet ways, and use artificial intelligence to assess this information to work out how well they are doing with the training and adjust it accordingly. Hopefully by enabling passengers to do other things while riding, we can stop feeling sick from being a barrier to the driverless revolution.